Corneal Molding, or CM for short, is an innovative, technologically advanced use of specialty contact lenses for unique vision correction. CM lenses are worn while sleeping and change your prescription by reshaping the surface of the eye, resulting in clear vision throughout the day without the use of glasses or contact lenses. HOW DOES CORNEAL MOLDING WORK? 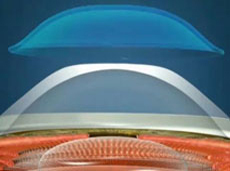 CM lenses work by gently reshaping the surface of the cornea. The lenses cause the upper layer of cells on the surface of the eye to move. This ultimately results in great vision! Sounds easy—so what’s the catch? During the initial treatment period, the cells may not all move uniformly, causing a temporary mild reduction in crisp vision. This only occurs during the initial treatment period and typically resolves itself with continued use of the CM lenses and rarely causes any difficulties. WHO WOULD BENEFIT FROM CORNEAL MOLDING? CM is a great choice for anyone, however, it can be extremely beneficial for certain people. The lenses are only worn while sleeping so symptoms like dryness, eye irritation and discomfort, along with many other contact lens related problems are eliminated. People with active lifestyles have an increased risk of infection or injury caused by wearing contact lenses or glasses during activities like contact sports, water sports or being in dirty environments. CM takes the risk away making this ideal for people with active lifestyles. CM lenses have also been shown to slow the progression of myopia, or nearsightedness, in children, so they will ultimately have a lower prescription than children who do not undergo CM. CM is completely reversible, which makes it an excellent alternative for those who are leery of refractive surgery. WHO IS A GOOD CANDIDATE FOR CORNEAL MOLDING? Corneal Molding is designed for myopia (nearsightedness), hyperopia (farsightedness), individuals with astigmatism and even for those that need bifocals (presbyopia). 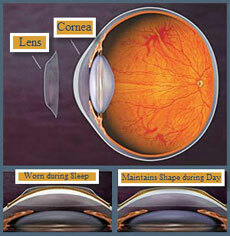 After a thorough eye exam, your doctor will be able to determine if your vision can be corrected by corneal molding. The doctor will also help you decide if corneal molding is a good choice for you. HOW LONG DOES IT TAKE TO ACHIEVE GOOD VISION? Some people report good vision the first day. Most, however, find it takes a few days before improvement is noted. The higher your prescription, the longer it may take to obtain your best vision. Optimal vision is usually achieved within 14 to 28 days. HOW LONG DOES CORNEAL MOLDING LAST? CM is only temporary. If you stop wearing the lenses regularly, your vision will return to its original state in as little as 3 days, but can take up to 4 weeks. This makes the therapy completely reversible. HOW DO I SEE WHILE MYVISION IS CHANGING? After you have begun CM treatment, your glasses or contacts will no longer be the correct prescription. You may need to wear your CM lenses for part of the day. Another alternative may be to temporarily use soft contact lenses in different prescriptions until your vision stabilizes with CM. Your doctor will discuss your options for the transitional period. HOW OLD DOES MY CHILD NEED TO BE TO START WITH CORNEAL MOLDING? At this time the FDA has placed no age restrictions on candidates for CM. Children 6 years old and older have successfully been treated with CM, however, 8 is typically is a good age to begin CM. WHAT WILL MY VISION BE LIKE WHILE WEARING CORNEAL MOLDING LENSES? Your vision should be excellent. One of the positive features of CM lenses is that if you have to get up in the middle of the night, you will be able to see without spectacles. Therefore, if you so choose during the treatment phase, you can wear your corneal refractive therapy lenses to see clearly. is a type of Orthokeratology and therefore not new. 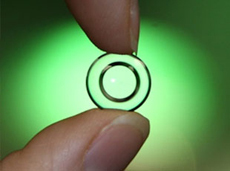 Advances in technology such as computerized corneal mapping, computerized lens manufacturing and the availability of oxygen permeable contact lens materials has allowed Orthokeratology to be taken to a new level. The availability of this new technology allows for the production of a therapeutic contact lens design which is completely unique. CM is the first corneal reshaping procedure to earn FDA approval for use while the patient sleeps. WHAT ARE THE RISKS INVOLVED WITH WEARING CORNEAL MOLDING LENSES? Wearing any contact lens involves a small risk. Infection of the cornea is a possible risk. Data indicates that contact lenses for CM do not provide a risk that is greater than other contact lenses. WHAT IS THE CARE REGIMEN FOR CORNEAL MOLDING LENSES? These lenses should be chemically disinfected after every use. You will be given instructions and a sample of your care system. CAN I GET MY DRIVER’S LICENSE CORRECTIVE LENS INDICATION REMOVED? Yes. You will need to go to the BMV and retake the vision portion of the driver’s license test. WHAT IS THE REPLACEMENT SCHEDULE FOR CORNEAL MOLDING LENSES? Typically, these lenses will be replaced every one to two years. Individual factors such as protein build-up, care of the lenses, etc., impact the frequency of the lens replacement. WHAT IS THE DIFFERENCE BETWEEN CORNEAL MOLDING AND CRT® LENSES? 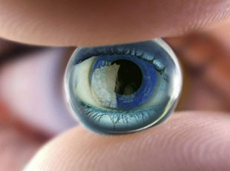 CM is the process of using specialty contact lenses to reduce myopia by reshaping the corneal surface while you sleep. CRT® lenses are a specific brand used for CM. CRT® is an FDA approved contact lens corneal reshaping system used to reduce or temporarily correct for nearsightedness. The method was approved in 2002 by the FDA for correction of up to –6.00 of myopia with up to –1.75 of astigmatism. The acronym CRT® is a registered trademark of Paragon Vision Sciences. 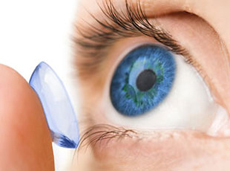 Wave Contact Lenses are a technological advance in contact lenses. An instrument called a computerized topographer maps the exact curvature of the front of the eye. The Wave Contact Lens Software is then used with the topography readings to create a lens to the exact specifications desired by the doctor. Each Wave lens is custom made for your unique eye shape. WHICH ARE BETTER PARAGON CRT® LENSES OR WAVE LENSES? Our office is very fortunate to have doctors that are certified fitters of both Paragon CRT® Lenses and Wave CM Lenses. We are proud to say we are one of the few offices in the area to have access to both lens types. This gives the doctors flexibility in choosing the correct lens type for you after completing the exam. Because of the infinite number of designs available with Wave designed lenses, we feel at this time that Wave Night Lens is the best technology available to achieve the best success. ARE CM LENS APPROVED BY THE FDA? Paragon CRT® lenses received FDA approval in 2002. Since then others have received approval. There are several corneal molding lens designs on the market. Some of the designs have specific FDA approval and some do not. The FDA only approves lenses that have a fixed set of curves and diameters. Although these lenses are very successful, they are limited in achieving the best possible result. Plus, when good results are not obtained initially with standardized lenses, achieving success is much more difficult. Consequently, almost all of our designs are customized, utilizing a computer aided design software called Wave. Wave allows for thousands of curves, sizes, and thicknesses measured in microns. Therefore, there are infinite possibilities in the final design of a lens. Accordingly, there are no “standardized” designs for Wave (CAD) lenses and therefore cannot receive “name brand” FDA approval. Wave has branded lenses designed with their software the Night Lens. The Wave Night Lens falls under the FDA approval for Bausch + Lomb VST® Visual Shaping Treatment (another brand of corneal molding lenses) because the resultant lens design can be approximately described by the range of designs that were part of VST’s FDA approved systems and are made with FDA-approved materials. Occasionally the optimum design of your lens falls outside the original parameters of VST. Your treatment will then be an “off label” use of VST. Even though these lenses are “off label” we feel these personalized lenses are the best option for a successful fit and are as safe as the FDA approved lenses. We feel this customization, in the hands of a skilled Orthokeratologist, is the best method to obtain clear, comfortable vision. CAN CM LENSES SLOW THE PROGRESSION OF MYOPIA? Myopia (nearsighted) rates worldwide have increased by 30% recently. Once a child is found to have myopia, studies show most children will progress on average at a rate of .60 units (diopters) per year through their growing years. Asians change on average at a rate of .90 units per year. There have been many theories attempting to explain this phenomenon. Some studies have proven some of the causes. But the science is constantly evolving. At this time, corneal molding is one of the most effective ways to stop the progression of myopia. In spite of corneal molding’s success in slowing the progression of myopia, some children may still continue to become more myopic. If this occurs, the doctor will discuss additional options available with you. An example is the treatment area of the corneal lens can be altered. This option is almost exclusive to the Wave Night lens. People with myopia have higher incidence rates of glaucoma, cataracts, macular degeneration and retinal detachments.